From January 22 to 24, more than 25 non-profit organizations attended the Get Involved Fair at the Doon campus. Established by Student Engagement more than 10 years ago, the fair provides students with opportunities to connect with community organizations seeking volunteers so they can develop new skills and leadership qualities to build their portfolios, enhance their resumes and grow their networks. 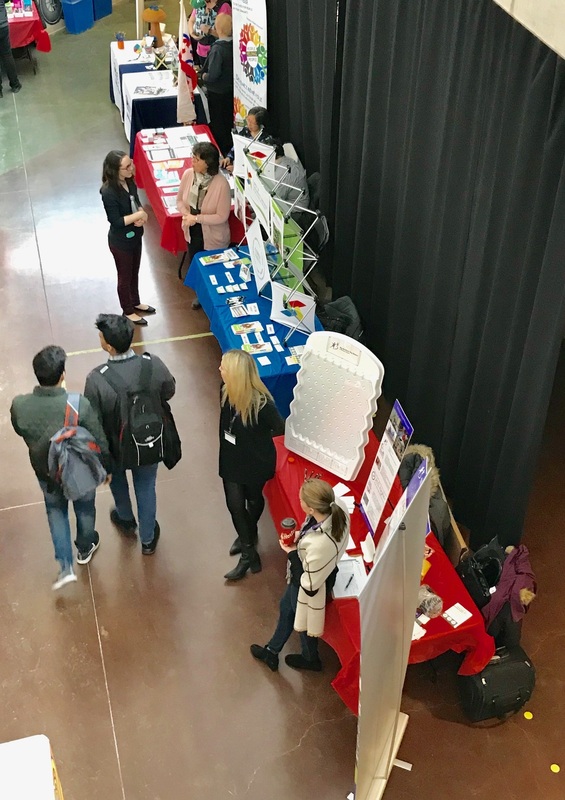 Conestoga's Student Engagement team hosted the Get Involved Fair at the Doon campus January 22 through 24 to connect student volunteers with community organizations. Among the agencies in attendance at the Doon fair were KW Habilitation, Girl Guides Canada, Big Brothers Big Sisters of Waterloo Region, Pride Stables and Adults in Motion. Rhonda Lee, of Family & Children’s Services of the Waterloo Region, said her organization has seen a steady stream of Conestoga volunteers over the years, mostly from the School of Community Services. A team from Revenue Canada attended the fair as well to recruit volunteers for community tax clinics, but agency representatives said attendance at the fair also gives them a chance to remind students about the free tax software available on Canada.ca, and share information about potential job opportunities. To support student involvement in the community, Student Engagement has started to partner with community organizations to officially recognize Conestoga student volunteers through the Co-Curricular Record (CCR) should the opportunity meet eligibility requirements. Conestoga’s CCR program documents and authenticates participation in approved co-curricular experiences, and contributes to learning and employability. Next week, the Get Involved Fair moves to the Waterloo campus. Conestoga’s Student Engagement team (formerly Student Life) meets the needs of students through innovative programming designed to achieve goals with learning outcomes-based initiatives including the Co-Curricular Record, Orientation, the Respect Campaign, the Connect Leadership Workshop Series, Campus Service Learning, and various student volunteer and committee opportunities.